A think tank called the Club of Rome commissioned the Limits to Growth. Researchers working out of the Massachusetts Institute of Technology, including husband-and-wife team Donella and Dennis Meadows, built a computer model to track the world’s economy and environment. Called World3, this computer model was cutting edge. The task was very ambitious. The team tracked industrialisation, population, food, use of resources, and pollution. 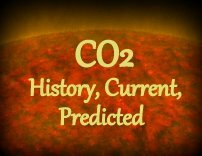 They modeled data up to 1970, then developed a range of scenarios out to 2100, depending on whether humanity took serious action on environmental and resource issues. 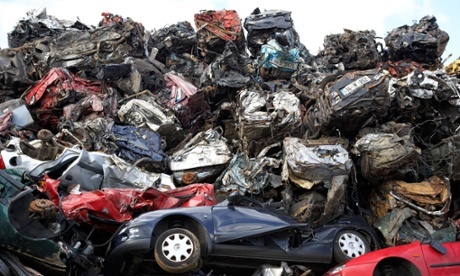 If that didn’t happen, the model predicted “overshoot and collapse” – in the economy, environment and population – before 2070. This was called the “business-as-usual” scenario. As the MIT researchers explained in 1972, under the scenario, growing population and demands for material wealth would lead to more industrial output and pollution. The graphs show this is indeed happening. 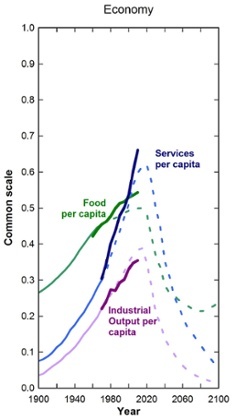 Resources are declining at a rapid rate, pollution is rising, industrial output and food per capita is rising. The population is rising quickly. 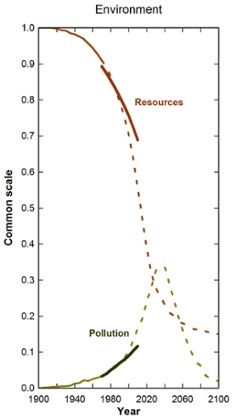 What to do about human population and resource decline? Help with the endangered species condom program. The massive human population and its resource use are responsible in our time for a great extinction of plants and animals. In all our endeavors for wildlife protection, we must never forget that the problems we see are often just symptoms of human overpopulation. Sign the Animal Bill of Rights. The ABR is a good first step on the way to essential respect for nature. We must not treat soils, vegetation, wildlife, air, and water carelessly if our planetary system is to fulfill its potential. The stars beckon, but first we must achieve sapience; we have to adopt something like Immediacy, the fictional philosophy of consequences. Follow environmental issues. 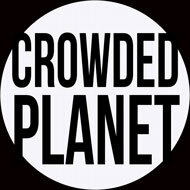 There are many conservation and news organizations. The NatCon News is an online source for current headlines and articles. This entry was posted in Population and tagged Climate Change, Club-of-Rome, Human Impact, human-population, Pollution, resource-decline by GarryRogers. Bookmark the permalink. Thanks for this post. We’ve been told for decades that there would be a “technological solution” to the problems brought about by overpopulation. It hasn’t happened. It won’t happen. We are draining aquifers, felling forests, fowling lakes. rivers and oceans and losing biodiversity at an alarming rate. We must begin to address overpopulation as the root cause it is and begin educating people to limit their fertility. I especially liked the paragraph about the Animal Bill of Rights. My own belief is that unless human beings learn to respect animals, and treat them with kindness and decency, there is no hope for our species. How is growth computed? What is NET Domestic Product? 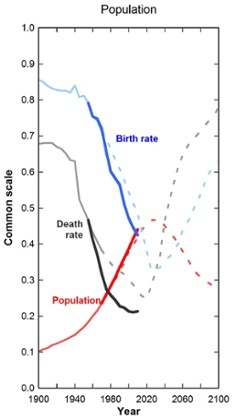 Growth as additions minus subtractions (e.g., for population the additions are births, the subtractions are deaths). The net domestic product (NDP) equals the gross domestic product (GDP) minus depreciation on a country’s capital goods. Net domestic product accounts for capital that has been consumed over the year in the form of housing, vehicle, or machinery deterioration. The data are available from agencies of the UN, US, & others. Modelling procedures are discussed in the book.